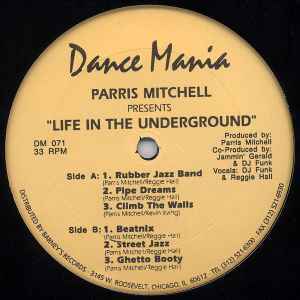 Note: some distortion pressed or recorded near middle of track C2 "The Underground". Does anyone know the original track which is sampeled in rubber jazz band? Unexpected sample of Liaisons Dangereuses "Peut Etre ... Pas" on Ghetto Booty is amazing. This double pack oozes what Dance Mania Records could pull out when it was having a good day. They had become more popular in Europe at the time (not to say that the producers were necessarily making music for us Europeans though), with the stream of releases, there could be a real quality issue with some of the production or even pressing. 'Work it!' is the most obvious and hitting track initially, beginning with a collage of ghetto/bump/booty samples that set the pace and scene. Simple heavy basslines and demanding fast repeat 'WORK IT!' samples follow to create dancefloor mayhem. The whole package however is full of minimal chicago treasures - 'Computer' remix is heavy on the groove, excellent and sparse. Perhaps the jazzy sample tracks don't stand the test of time, they were more the flavour of the moment. The rest is timeless and proud - where minimalism meets the bumping and grinding disco booty! "Follow Me Ghetto" is an acid and ghetto style cover of the big classic "Follow Me" by Aly Us. Quite fun, effect on the crowd guaranteed !